The white stone buildings of the city gleam like scattered pearls, their peaks and towers reaching for the vertiginous blue of the sky. Atop the spires and turrets and minarets, domes and curlicues of gold-leaf sparkle, making the city seem dusted with slow-burning embers. The ghost of the giant Gustav, the city’s architect and creator, walks cobbled alleyways that are carpeted in moss, skimming past the tiny ferns growing from arched doorways. It is the city he built for his flame-haired Julietta. His place of torment since the day she left. Everywhere – everywhere – are monuments to Julietta. Ivy-covered statues, beaten copper friezes, emerald-roofed cenotaphs carved with elegiac verses. As though all of them together might be woven into a spell under the splinter-moon to bring her back again. Julietta left the city long ago, much longer than Gustav cares to remember. So he holds the city close like a well-worn photograph, folded and re-folded and disintegrating with time. Without it, he’s scared that he wouldn’t remember her face, her voice, the touch of her skin. Sometimes, he thinks he sees her as a silver shadow slipping through the streets, leaving an unearthly sheen on the darkening stone. In spring, he glimpses her running in her yellow velvet cape towards the opera house, flanked by the singing fae who bear the remnants of her voice. Gustav tries to be content with the scraps time has left behind. But doubt frays his edges. Once, this was a city for two. But before she left, Julietta opened the city to mortals, left it behind for them like a discarded toy. He can’t remember if, in doing so, she had been deliberately cruel or just thoughtless. The people now living there are tiny and insignificant and shiver just a little when they pass through Gustav’s ghost as he sits by the glass butterfly house or, in petulant moments, sprawls across the palace steps. In the city of giants, of grandeur and vast sorrow, jewels and alabaster, red-haired sylphs float, unseen by its inhabitants, who are busy in the business of being ordinary. They are wisps of women, a thousand images of Julietta woven and rewoven, painted and sung, sculpted and remembered and reshaped in the years since she left. Red-haired sylphs float as twists of breeze or phrases of song the ear can’t quite catch. They drift and glide, wrapped in tresses studded with tiny blue flowers, smiling lasciviously at Gustav, who can only watch as people overrun his city. He stares at the sky. He wonders, yet again, if one day the sylphs will forget him, too. Gustav shakes them free. He does not feel like listening to them today, whispering in her voice about the roads she might have taken, the places she might be found. Reminding him that he no longer remembers exactly the colour of her eyes, or whether she smelled of rosewater or sandalwood. As though unfolding the old photograph, he traces his hands over the lines of the buildings and the streets, where each day the gold dulls a little, the cobbles wear just a bit more. Only the ghosts of giants and half-maidens who were never more than an imitation remember how it felt when the city had its soul. The warm pliability of compliant stone; the seasons that formed themselves around Julietta’s moods. The door to the palace, banded with iron curled into daemons and lovers and winged serpents that change with the light, resists his touch. Beyond are frescoed rooms, gas lamps and clockwork faeries to serve a princess’s every need. But the door stands firm, the treasures beyond it shielded from sight. The longer she is gone, the more your city slips away from you. Only the doors with gilded handles are open to you now, the sylphs sigh. Gustav can count those handles on one hand. They fade further every day. He sits heavily on the marble outside the butterfly house – to the mortals it feels like a squall of wind gusting by – and presses his ghostly nose to the glass. Butterflies – sapphire, citrine, fuchsia, amber – flit up to him as though he is a honeyed treat laid out by their keepers. Above the entrance, a clockwork butterfly, an imitation of the real ones inside, flutters its wings, takes flight on the quarter hour then lands again. The sylphs stroke Gustav’s hands, trying to cheer him in their sweetly savage way. Once upon a time, an emperor’s courtiers built a nightingale from glass and rubies and gold and ribbons. The emperor loved the clockwork bird much more than he had ever loved the real one, with her plain brown feathers and unpredictable tune. Yet she continued to love him long after he had forgotten her in favour of the imitator. The giant poked his finger moodily at the glass, scattering the butterflies. Your Julietta, she waited for you as long as she could, dearest, while you were building her memorials. She had cities inside her, waiting for you. Vast and unpredictable and waiting to be explored. One day, all the doors here will be closed to you and you will just be thunder fading in the distance. That is the way of echoes, dear Gustav. If they weren’t so like her, he would wrap their flaming tresses around their throats. Swallows dart and swoop from the sky, skimming through his chest in a gust of air. He follows them as they make their way back to their nests in the city’s walls, which were carved with stories written for Julietta, lit at different hours by the sun or moon. The swallows have burrowed through the words so the stories are now just nonsense phrases. Is there nothing left in the city that remains as it was in the beginning? Gustav walks along the wall, reading its broken stories in the late afternoon light. He stops at the south-west corner, where he had long ago tethered a hot air balloon to the wall with creeping vines of purple roses and ruby-seeded pomegranates. He used to bring Julietta here, lift her up to sit in the basket to view the city, its architecture his ever-expanding love letter to her. Surely she had never doubted his heart, laid bare in the streets and passageways and grand buildings with their solid language of stone? But it is this corner to which she made her own way one day, climbing the tethers and scattering purple blooms and red, red seeds in her wake. It is the corner from which she made her escape. The word jolts Gustav and he repeats it aloud, rolls it around on his tongue. “Escape. Escape…” Until today, he had always thought of her as running away, having left him and spurned his gift of her own city. But that word – escape – bubbled up from a forgotten city deep inside him. Another broken story on the wall glows golden in the afternoon light; like the gilded handles, it admits him to somewhere that could easily have been lost. a faded wraith-story of missing her. But it was not she who doubted…. With that quiet realisation, Gustav sees his city as Julietta must have seen it, in the end. “My dearest Julietta, there is nothing of you here,” he whispers to the swallows as they dive through air. The rose vine is just thorns now, tangled among the pomegranates that have run wild. As he speaks, one of the wispy wraiths, a distant echo of Julietta whose colour has faded to a rosy silver, snakes through the vine. She beckons to him, giggling, and curls herself at the base of one of the rose bushes. He pushes his hands through the vines towards her. She fades until nothing is left but a beating light the colour of the sun. Reaching further, towards the buttery glow, Gustav wishes that he could feel the thorns scratching at his skin. Chunks from the wall are scattered among the gnarled roots of the bush, the carved words insensible as even sentences, let alone stories. Two of those clay-cast words glow in the aftermath of the sylph’s touch, a lighthouse call across the years to Gustav. They gleam brighter as he stares at them. Find me. He thinks about all the things that she loved: moonlight, early morning, stone bridges over fast-flowing rivers. He smiles as the memories rush through him pulse-quick. Bitter chocolate, wild storms, autumn frost, the light of deepest winter. He stares at the sky. He wonders. 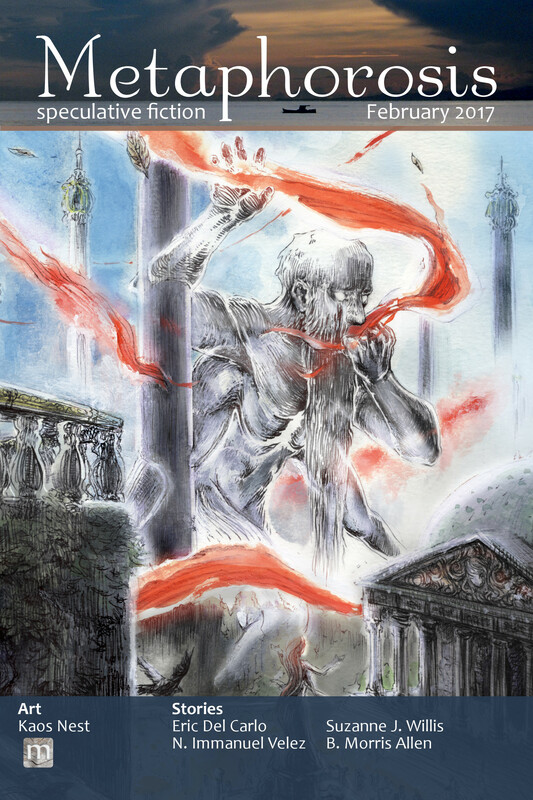 Then he begins to run, along the wall, through the gates, up and down the streets until he finds the sylphs giggling and splashing in the city’s central fountain. What happened to the emperor? Gustav asks. The clockwork bird ran down and the real nightingale came back, singing him songs from the cherry tree, singing him back from death. The sun sets, the changeling light serpentine as it twists through hidden alleys and doorways collapsing on themselves. Gustav lies on the cold earth as the sylphs pull the darkness over themselves like a blanket. Sighing, crooning, slipping into sleep. This city is a story no-one bothers to read, a clockwork nightingale whose gears have rusted silent. But as Gustav lies down next to his red-haired sylphs who smell of cinnamon and autumn, he no longer sees Julietta’s pale flesh in the alabaster stone. Julietta’s smile peeking from the ivy statues. Julietta’s touch in the mist that rolls from the palace windows. He stares at the indigo sky. He knows what he must do. Tomorrow, the city may fade a little more, but it no longer matters, for he will not be here to witness it. Tomorrow, he will leave from the corner of roses and pomegranates, and follow the winds that took her away. With those two burning bright words – find me – he will search across lands and ocean, seasons and storms. He will find her and they will build a new city together, one of bridges and clock towers without hands to stop the passage of time. A city not of stone, but of all the thoughts and longings unspoken that fill the spaces between the rooftops and hover above the streets. With sylphs and olive-plump moons and infinite brightness inked by their careful hands. A city that they will call home, with unchartered streets they will explore together. Be she old and faded, or bones and ghost, Julietta will write her own words on the walls and Gustav will beg her leave to map the cities running wild inside her.